This year, Governor Wolf proposed $1 billion in new and increased taxes. In 2016, Governor Wolf proposed $3 billion in new or increased taxes. And in 2015, Governor Wolf stood on the Rostrum of the House and proposed $8-plus billion in new and higher taxes, including the Personal Income Tax (PIT), Sales Tax and business taxes. The governor also proposed to borrow $3.7 billion. That’s $12 billion the governor proposed in new and increased taxes on every working family and business in Pennsylvania. And billions more he hoped to borrow. Because some things are worth fighting for, we killed the PIT increase many took for granted was happening. Thanks mainly to House Republican efforts, the deficits and extra spending were curtailed and balanced by using existing state revenues, updating the sales tax to acknowledge technology, tobacco, and gaming. Again, thanks to efforts of House Republican Caucus members, Pennsylvania’s residents and businesses have been saved from more than $1 billion in new or increased taxes… for the third year in a row. The budget process began with a deficit from the previous year created by Governor Wolf continuing to spend, and Treasurer Torsella continuing to issue checks when both knew full well that the revenues were not keeping up with the Budget Secretary’s official projections. 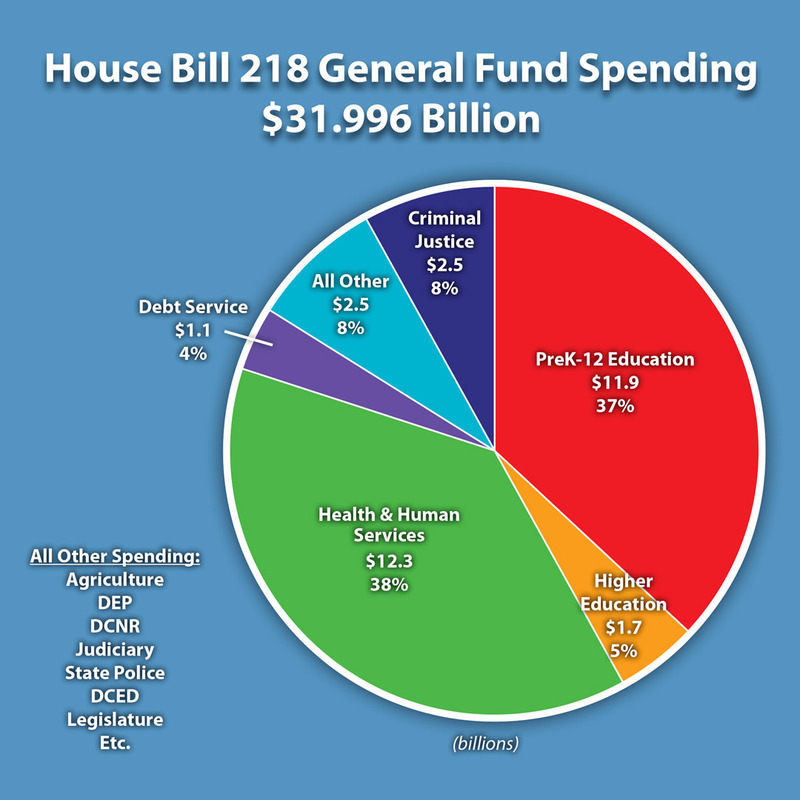 To close the deficit and pay for his insatiable spending appetite, for FY 2017-18, Governor Wolf proposed a $32.34 billion General Fund budget – approximately $500 million more than the previous year. • Severance Tax – 6.5 percent on the natural gas extraction projected to raise $293.8 million. • Insurance Premium Tax – Expands tax to most previously exempt insurance entities, projected to raise $141.5 million. • Sales Tax – Removes exemption for custom programing, design and data processing, projected to raise $330.3 million. • Sales Tax – Removes exemption for commercial storage, projected to raise $153.6 million. • Sales Tax – Removes exemption for aircraft sales, use, and repair, projected to raise $5.1 million. • Sales Tax – Removes exemption for airline purchase of catered food and non-alcoholic beverages served to passengers, projected to raise $800,000. In July, the Senate passed a revenue package which included $405 million in new or higher taxes from a gross receipts tax on natural gas, electric and telecommunications bills. The Senate also passed a new severance tax to bring in approximately $100 million. House Republicans STOPPED these onerous taxes as well. • Identify special fund transfers of $300 million to help obviate the need for additional taxes. Tax increases should be a last resort, not a first option. • Require the Auditor General to audit the Delaware River Basin Commission and Susquehanna River Basin Commission, at the expense of the commissions. • Protect Excellent Teachers by allowing school districts to keep Pennsylvania’s best teachers in the classroom, the School Code will end the practice of seniority-based layoffs. Instead, the legislation would require teacher performance to guide furlough and reinstatement decisions. • Reduce the debt ceiling by $300 million. >> Wins for Education in the budget code bills. >> Read the 2017-18 state budget timeline. - Increases spending by just 0.2 percent, well below the rate of inflation. - Core functions of the Pennsylvania government are covered, while successfully restraining additional spending at under $200 million. This was accomplished while facing significant increases in mandated spending (such as pensions, health care and human services). - Thanks to early actions in the House budget plan that passed on April 4, this final budget plan saves taxpayers hundreds of millions in wasted government spending. - The Department of Human Services and the Department of Health will be merged into one. - Also, the Department of Corrections will also be merged with Probation and Parole. - These mergers wil help to eliminate government redundancies while still allowing these important state agencies to continue in their individual missions. This budget includes the highest levels of school funding in Pennsylvania's history. - Increases basic education funding through the Fair Funding Formula by $100 million to $5.995 billion. - Increases early childhood funding (Pre-K Counts and Head Start) by $30 million to $226.5 million. - Restores Gov. Wolf's harmful pupil transportation cut to school districts. - Increases special education funding by $25 million to $1.122 billion. 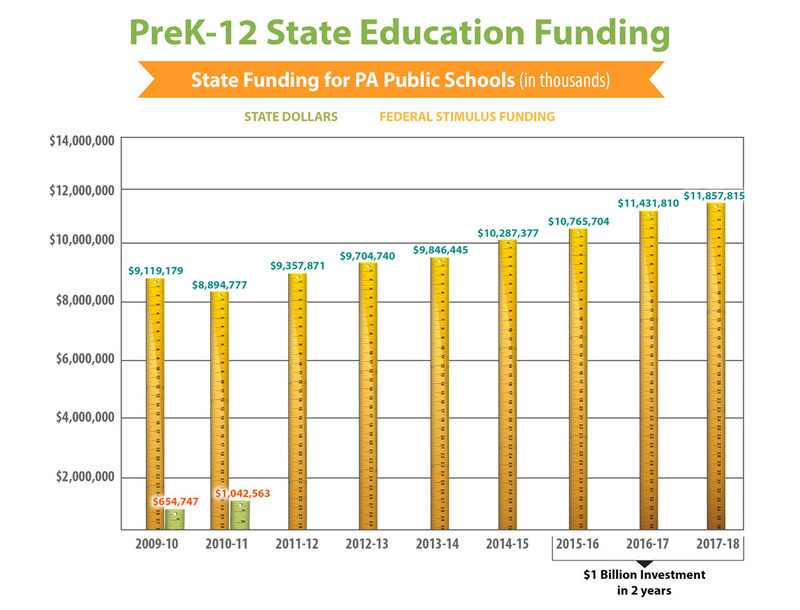 - Sets a record high amount of PreK-12 funding at $11.86 billion. This means that the Republican-led legislatures will have increased Pre-K education by $1 billion over two years. - Maintains support for Pennsylvania's state-related universities at current levels, and the State System of Higher Education will receive an increase of nearly $9 million.